Perfectly Paired Penguins: King Penguins in the Falklands exhibiting what is called a “mutual ecstatic” display, a bonding behavior. © 2014 Avid Travel Media Inc. Yesterday, I wrote about how Seabourn Quest’s captain managed to get us to the Falkland Islands, despite a malfunction that caused a two-day delay in an unscheduled port of call. We were actually quite lucky, arriving in Port Stanley, the capital of the Falkland Islands, on a sunny and warm day. I wrote about my experience that day in Penguins & Pints: Seabourn Quest Calls On Port Stanley, Falkland Islands. The Falkland Islands makes for a good stop before setting sail across the Drake Passage, not only so that you can exercise your land legs but also so that you can see King Penguins, a species that you’re not likely to see in Antarctica. That’s right. Many people are surprised to learn that they will not see large penguins in Antarctica. 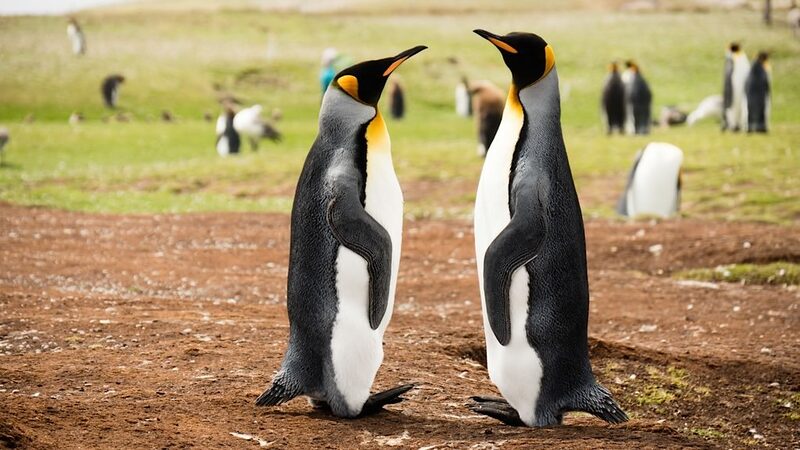 King penguins are found in the Falkland Islands and in South Georgia, so if your goal is to see those, find a good travel agent who can help you book your cruise accordingly. The photo above was snapped on an excursion to see the kings on the day that we were in the Falklands. The two penguins are exhibiting a bonding behavior known as “mutual ecstatic.” They are basically mimicking one another. The behavior is thought to strengthen the bond of penguins during breeding season. Ralph I travel to the Magical White Wonderland vicariously with you in every posting as I am longing to go. I Ihaven’t held off this long as I am not sure whether it would be worth my while as I a almost chained to a walker. I did however see a photo on one of your voyages where someone in a wheelchair was ecstatic as they had been transported somehow onto a zodiac (?) and taken to the shore. In your opinion is an Antarctica cruise still worthwhile for someone such as myself and if so, is there a cruise line/ship you would particularly recommend? I am not in a wheelchair (yet!) and can navigate short distances with a cane, but for anything else I really need my walker. Your thoughts please? Thank you. Catherine, thank you for your comments. I would absolutely consider the trip if I were you. Yes, the lady in the wheelchair (there were two people in wheelchairs, by the way) was ecstatic. The photos barely reflect her true enthusiasm for the whole trip. Incidentally, I learned that she was a star athlete when she was young, and a botched surgery put her in the wheelchair for life. I have never met a more positive person, so the first thing that she took with her to Antarctica was a positive attitude that impressed all of us who met her. So if you go with a positive attitude and your cane and walker, and you go with a cruise line that will take care of you, such as Seabourn, I think you would really enjoy the trip. If you did nothing more than to observe Antarctica from the ship, you would likely come away having had a satisfying experience. Now, here is a big caveat. The wheelchairs did not go ashore. It’s too difficult to “land” on the beaches for wheelchairs. They did Zodiac cruises along the shorelines, past glaciers, etc. And on most days, the sea was too choppy – not bad choppy – but too choppy to get them into the Zodiacs. I think going ashore may be difficult for you with limited mobility. Why don’t you talk with Seabourn about it? Also, there are cruise lines that offer “drive-by” cruises and if you’re not doing “landings” they may suited for you as well.